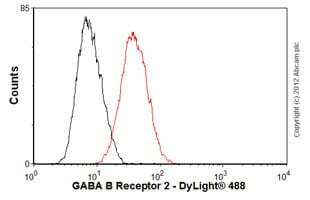 Synthetic peptide within Human GABA B Receptor 2/GABBR2 (C terminal). The exact sequence is proprietary. Human cerebellum lysate; human brain tissue. Our Abpromise guarantee covers the use of ab75838 in the following tested applications. WB 1/500. Predicted molecular weight: 106 kDa. Alpha-helical parts of the C-terminal intracellular region mediate heterodimeric interaction with GABA-B receptor 1. Cell membrane. Cell junction > synapse > postsynaptic cell membrane. Moreover coexpression of GABA-B-R1 and GABA-B-R2 appears to be a prerequisite for maturation and transport of GABA-B-R1 to the plasma membrane. We recommend not to boil the samples after lysis to get desired WB results. ab75838, at a 1/100 dilution, staining GABA B Receptor 2/GABBR2 in paraffin embedded human brain tissue by Immunohistochemistry. Immunohistochemistry (Formalin/PFA-fixed paraffin-embedded sections) - Anti-GABA B Receptor 2/GABBR2 antibody [EP2411Y] (ab75838)This image is courtesy of an Abreview submitted by Estella Munoz. Ab75838 staining GABA B Receptor 2/GABBR2 in Rat Postnatal (P15) Cerebellum by Immunohistochemistry (IHC-P - paraformaldehyde-fixed, paraffin-embedded sections). Tissue was fixed with paraformaldehyde and blocked with 10% serum for 1 hour at 25°C; antigen retrieval was by heat mediation in a 10mM citrate buffer, pH6. Samples were incubated with primary antibody (1/400 in PBS with 2% donkey serum) for 16 hours at 25°C. An Alexa Fluor® 488 conjugated Donkey anti-rabbit, polyclonal was used as the secondary antibody. 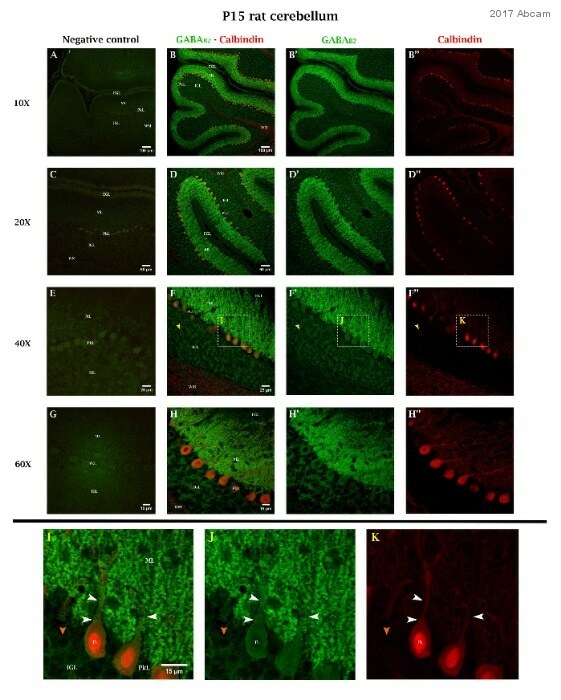 IHC and confocal microscopy for GABA B Receptor 2/GABBR2 (GABAB2) in the postnatal rat cerebellum. (A, C, E, G) Negative control by omission of the primary antibody at 10, 20, 40 and 60X. (B-B’’, D-D’’, F-F’’, H-H’’) Immunolabeling for GABAB2 (green) and/or the calcium-binding protein calbindin (red) at 10, 20, 40 and 60X. 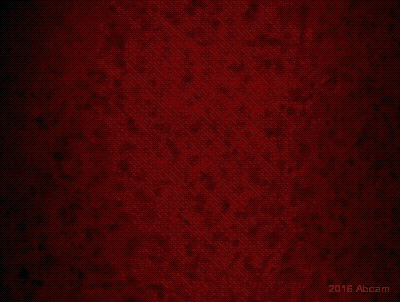 (I-K) Zooms of the insets shown in F-F’’. Specific signal for GABAB2 is mainly observed in the molecular layer (ML) and internal granular layer (IGL) of the cerebellar grey matter. Purkinje cells (PkL) are enriched in GABAB2 especially at the surface of the dendritic trees (white arrowheads) oriented towards the ML. 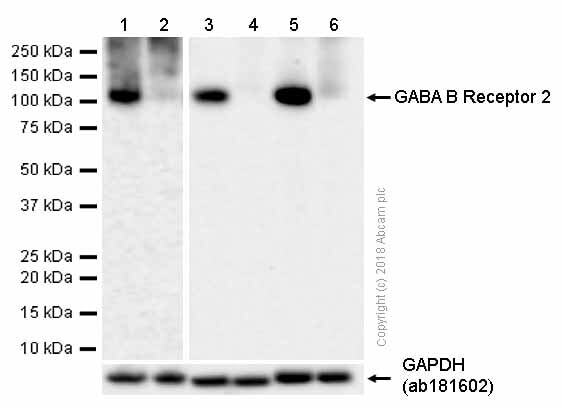 Golgi II cells (yellow arrowhead) located in the IGL are also positive for GABAB2. EGL: external granular layer. n: calbindin-positive nucleus of a Purkinje cell. Orange arrowhead: GABAB2-immunoreactive granular cell in the IGL. WM: white matter. An Olympus FV 1000 confocal microscope was used and images were processed with Adobe Photoshop CS4. Figure generated by Juan Vilchez Aruani and Estela Muñoz, IHEM, UNCuyo, CONICET, Mendoza, Argentina. Overlay histogram showing SH-SY5Y cells stained with ab75838 (red line). The cells were fixed with 4% paraformaldehyde (10 min) and then permeabilized with 0.1% PBS-Tween for 20 min. 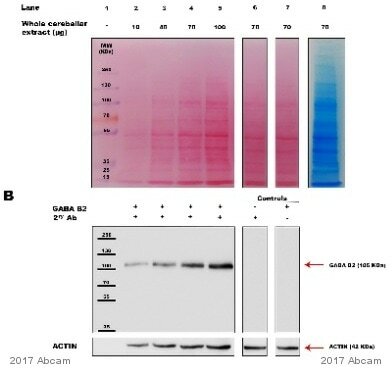 The cells were then incubated in 1x PBS / 10% normal goat serum / 0.3M glycine to block non-specific protein-protein interactions followed by the antibody (ab75838, 1/50 dilution) for 30 min at 22ºC. The secondary antibody used was DyLight® 488 goat anti-rabbit IgG (H+L) (ab96899) at 1/500 dilution for 30 min at 22ºC. Isotype control antibody (black line) was rabbit IgG (monoclonal) (1µg/1x106 cells) used under the same conditions. Acquisition of >5,000 events was performed. This antibody gave a positive signal in SH-SY5Y cells fixed with 80% methanol (5 min)/permeabilized with 0.1% PBS-Tween for 20 min used under the same conditions. Publishing research using ab75838? Please let us know so that we can cite the reference in this datasheet.